Thanks to the Hot Springs Story iPhone app, I haven’t slept much the past couple of days. 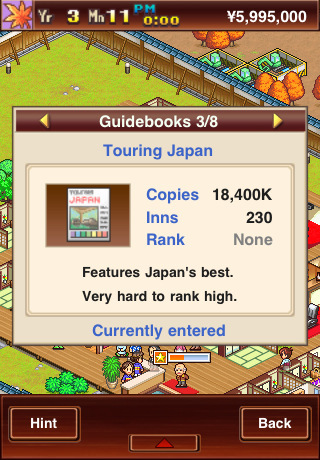 You might not think a game all about managing a humble country inn could be that addictive, but you’d be dead wrong, because this is the latest offering from Kairosoft, makers of the digital crack also known as Game Dev Story. Admittedly, it may not have the catchiest title in the world, but this Japanese to English import is straight-up 8-bit magic. Hot Springs Story has the same retro appeal as Game Dev Story, but the developers have gone out of their way to change up their successful formula just a little bit this time around. Instead of game development and human resources, this time the game is all about building and landscaping, and the overall tone is a lot more SimCity-ish than anything else. You start off with a modestly sized inn, a handful of cash, and a brief tutorial to get your started. Your goal? To create the best goddamn hot springs inn Japan has ever seen! Each year, you compete against other hot springs in various magazine contests. Some magazines have specialized interests, like food, but no matter which contest you’re in, if you win, you get a shiny trophy, a cash prize, and mad bragging rights. There’s no real penalty to doing poorly, but why bother if you’re not in it to win it? Initially, all you really need is a couple of hot springs and some rooms for people to stay in, but over time, you’ll gain access to all kinds of additions, like swanky restaurants, chic salons, and even pachinko parlors and arcades. All it takes is a few taps and enough cash and you can start building new “facilities”. Now, the beauty of this game lies in the details, so naturally, what you build is key, but where you build can be just as important. As you expand, you start to get a feel for which configurations work best, and you’ll be rewarded or punished for certain set-ups. For example, sticking a noisy pachinko parlor next to quiet tatami room is going to make for some unhappy guests. Also scenery is a huge factor, so you really have to pay attention to how to make the most of your landscaping. Your clientele is a pretty varied lot, so different things will appeal to different groups, and keeping the guests happy is what will earn you the big bucks. Rather than the quirky individuals from Game Dev Story, guests are types, like Student or Housewife, but there’s a large pool for you to try to win over with pretty gardens and aggressive advertising. Advertisements are one way of winning new guests, but there is also an option that lets you “invest” in the community as a means of improving your establishment. By “investing” a certain amount of cash to various projects people bring to you, you’ll be rewarded in some way. In some cases, this means a new kind of guest, in others, it opens up new items you can purchase from the shop to add to your growing hot spring palace. The game is at once incredibly simple to learn and play, but at the same time, that beautiful Lego-esque state of constant building, destroying, and rebuilding, always searching for that optimal configuration, is so satisfying. All told, I didn’t find the game quite as addictive as Game Dev Story, but that’s kind of like saying I don’t find snorting cocaine quite as addictive as mainlining heroin. They’re both absolutely fantastic games, and they will utterly and gleefully destroy your sleep schedule like you don’t even know. Now, I could spend hours describing the ultimate pleasure resort I created in my game, but wouldn’t you rather make your own? Sample the free version of Hot Springs Story on your iPhone. 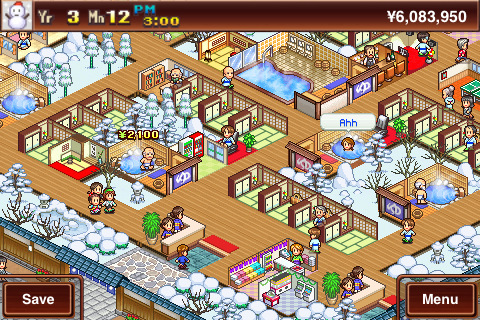 AppSafari review of Hot Springs Story was written by Tracy Yonemoto on March 17th, 2011 and categorized under App Store, Featured, Fun, Games, Resource Management, Strategy, Time Management. Page viewed 4459 times, 1 so far today. Need help on using these apps? Please read the Help Page.